So we brought the kittens downstairs for a while on Sunday. They need to be exposed to different sounds and movement, so they will be confident in their new homes. Tanner was in heaven! He loved having this size baby around again. He washed everyone and played with them gently. The Panthers all did well too with the kittens. Flynn and Harrison were very curious about them. Oliver played for a bit and then started growling at them some. Cousin Georgie wasn't happy at all and had to be put upstairs in another room. He doesn't like change! 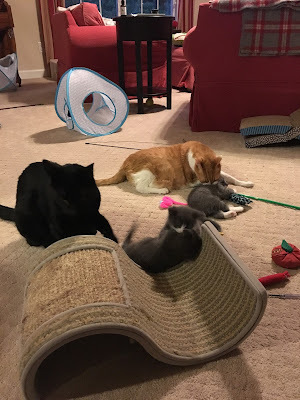 The kittens did very well. 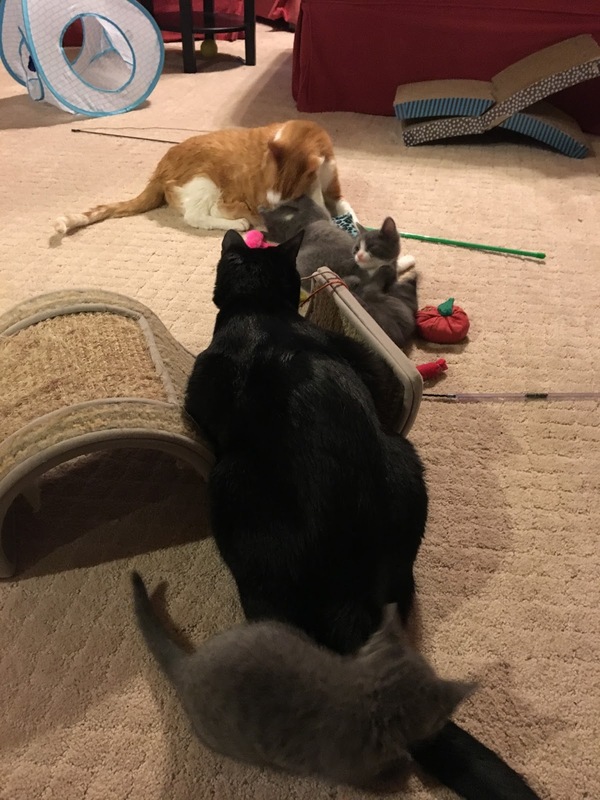 They explored and played and discovered the catnip banana! They had had a big day because a friend had been over with her three children. 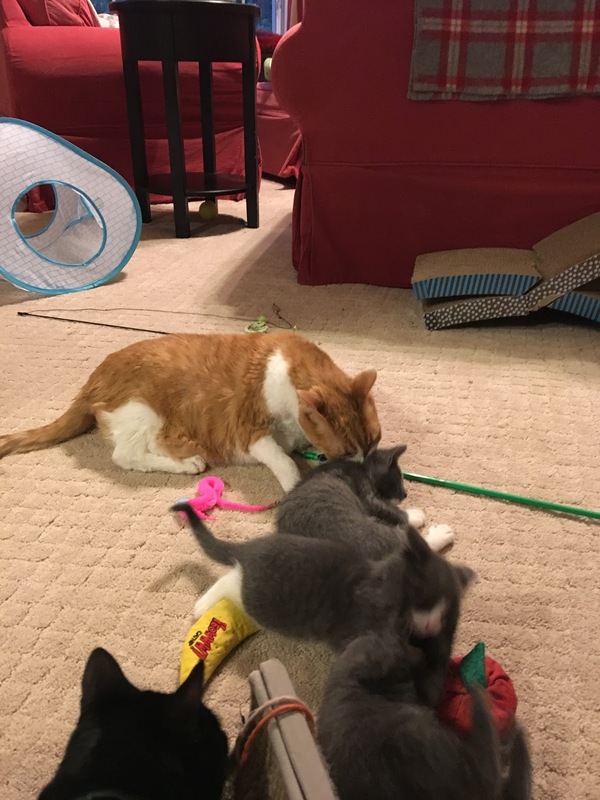 The kittens were handled a lot during their visit! After a while, everyone was wiped out. Solomon fell asleep hugging his new toy! Here's a video of Tanner playing with Solomon. Awww those kitten are soooo cute. Good job with socializiing them. Nothing sweeter than kittens or maybe puppies too. awwww my mom is melting too ! Nicki would have to be put in a room, I think. Not sure how Derry would react to little ones! Tanner is so sweet with the babies! He's such an awesome and rare guy. Wow, Tanner is so great with those kittens. We wouldn't be so accommodating. 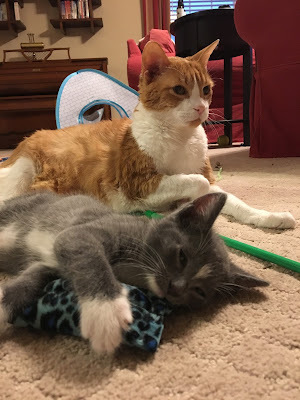 That last picture of Tanner watching over Solomon is a real keeper ! 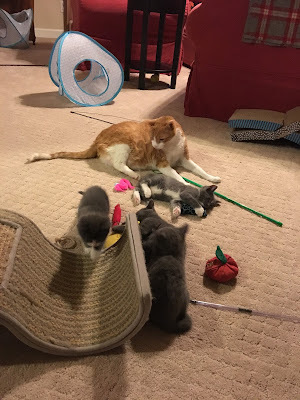 Tanner sure is a sweetie and is helping the kittens learn.